So now this homepage goes live! Out with the old in with the new. My old project blog is still intact http://projectblog.erikajanunger.com/#home – however, from now on, I will update details from the path of my creative journeys right here. So stay tuned. Ever since me and Oskar Frisk made the film “Longing to fly/ Longing to fall” together, we have been dreaming of turning the tilted idea and scenography into a live-performance. 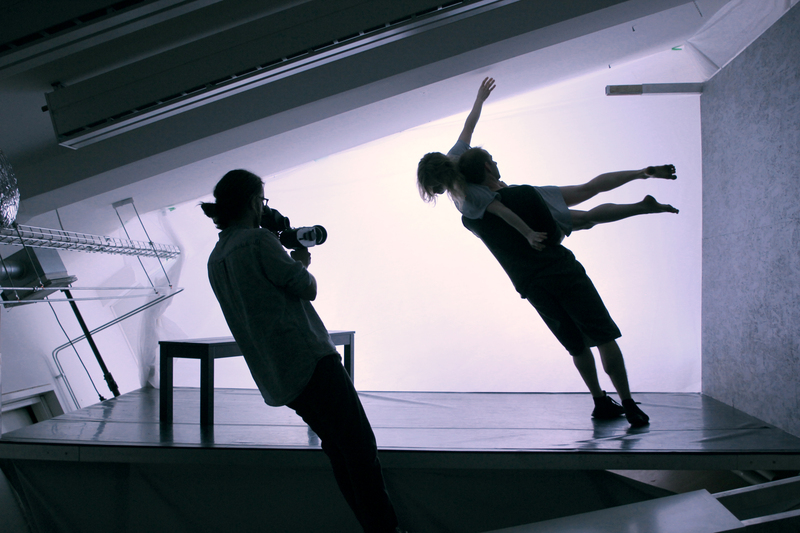 When shooting the film, we realised that watching the dancers using the scenography and the tilted monitor image simultaneously, was truly emotional and indescribably beautiful. So we decided to turn this into an experience for audience. So Oskar rebuilt the set in a nearby location and has for the last couple of months been teaming up with the magnificent dancer Anna Ehnberg, to further explore the possibilities of the sloping floor. Meanwhile, I focused on producing music for it. This past Sunday we had our first sitting with an audience! Exiting stuff. We also took the opportunity to film everything to create a trailer. The plan is to use it to look for some funding to further developing the idea into a finished performance. Director of photography was the lovely Fredrik Ekholm and the lighting was done by Christian.